Do you have photos, historical accounts or other items pertaining to the Northome area? Would you like to share this historical information with the world? LakesnWoods.com would like to publish your Northome photos (current or historical) or historical accounts on this website. Original materials can be returned and your privacy will be respected. By referring to the Plat of NORTHOME, we find that the same is located on Lot 1 and NW¼, NE¼, Section 30, Township 151, Range 28, West of the Fifth Principal Meridian. By referring to the Book of Original Entry in the office of the Register of Deeds, we find that John Gladen made Timber and Stone entry on Lot 1, Section 30, Twp. 151, Range 28, on March 1, 1900, and was issued patent on February 13, 1900. By referring to the Book of Original Entry in the office of the Register of Deeds, we find that John Bruheim made homestead entry on NW¼, NE¼, Section 30, Twp. 151, Range 28, on October 13, 1900 and was issued patent on March 5, 1903. Above are the first three entries as found on the copies of the abstract as filed in the records of the Register of Deeds at the Koochiching County Court House, in International Falls, Minnesota. 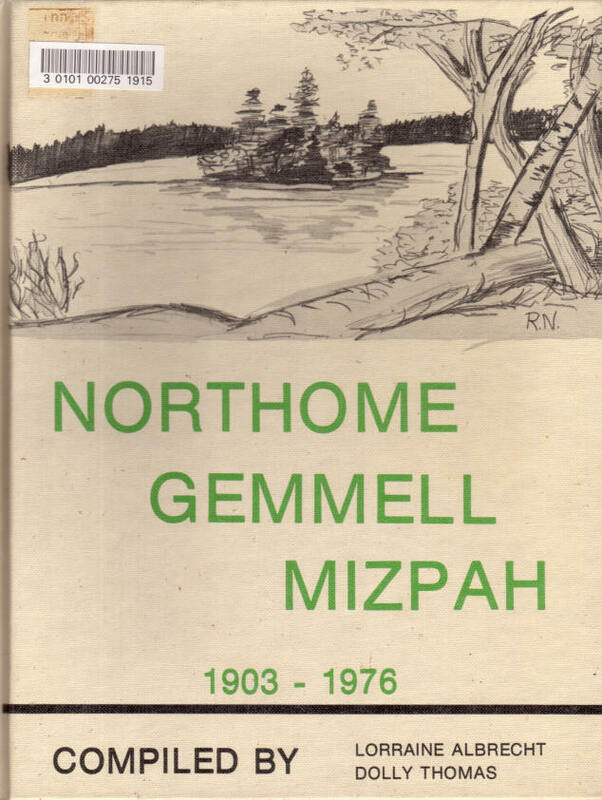 In talking with James Palm our current Register; we find that Northome is comprised of land from two previous owners, John Bruheim, and John Gladen. After passing through the hands of several owners the Backus, Brooks Company became owner of both parcels of land and sold their interests to the Northome Townsite ;Company of Blackduck. A Hiram Simons, Attorney, was the person handling the Townsite Company affairs at Northome. This was when Northome was still Phena. Northome has not always had the same name. The town began as New Bridgie, when Ole M. Olson became postmaster the name was changed to Phena. This took place on Feb. 6, 1902. Mr. Olson's wife's name was Josephena, thus the name Phena was arrived at. On June 6, 1903 the name was again changed, this time to Northome. This last bit of information was furnished to us by Delmer Anderson, our local postmaster. Delmer received the information from the United States of America, General Services Administration, National Archives and Record Service, Washington, D.C.
On Sept. 10, 1903 an election was held; voting on becoming an Incorporated Village. Sixty-one votes were cast, all voting yes. Thus Northome became officially a thriving Village. Information on the official procedure of the formation of Northome as a Village are very incomplete. In fact the only information available are the Articles of Incorporation. From them one is able to draw the conclusion that a census was taken and it was determined that on July 7, 1903 there were 168 residents living in Northome at that time. On July 13, the court was petitioned by 30 signers asking to become a Village. This was presented in Grand Rapids, Minnesota, as Northome was a part of Itasca County at that time. In 1907 the County was divided making International Falls the county seat. An election was held on Sept. 10, 1903 for incorporation. The first council meeting was held on Oct. 1 at 10:00 A.M. in the Northome Hotel. President was Feldman, Trustees were Grindall, Brenan, and Beach, Recorder, Sheir. The Treasurer's name was not given but his salary was set at $50.00 for the balance of the year with a $10,000.00 bond. During this first month 10 meetings were held. Most of these meetings were held to act on liquor licenses, with Jack Neary, apparently being the first owner to obtain his license; followed by Ed Feldman, Wilks S. Booth, Brannon, Thompson and Bergsevenson, and Hill and Blocker. Ten articles or by-laws were acted upon and approved. Three ordinances were adopted; the third ordinance dealt with disorderly houses. H.C. Ross was the appointed Marshall, Street Commissioner, and Fire Warden at a combined salary of $50.00 per month. Several ordinances were approved during the first years as a Village. Some of them being the prohibiting of cattle running at large, prohibiting the playing of pianos except between the hours of 5 A.M. and 10 P.M., also the burning of rubbish on streets was banned. Recording fee for Articles of Incorporation was $5.00. Prices in the early 1900's were really quite reasonable. A keg of nails sold for $3.00, pine and cedar lumber cost $14.00 a thousand. One day of common labor was $1.50, wood was from 95¢ to $3.75 per cord. On Feb. 7, 1905 cemetery lots sold for ..... inside lots $10.00, corner lots $15.00, and $3.00 for a quarter lot. Liquor licenses were very high. With a recording issuing a license to Hugh Mc Intosh when the fee of $490.00 was paid. This being for one year. Even soft drink licenses were high as an entry on Dec. 21, 1921 stated having trouble collecting a $365.00 soft drink license. The price was set at $50.00 per year. Soft drink license was raised back up to $125.00 for six months. It doesn't say if it was left this way or again changed. It seemed the people were selling without a license. 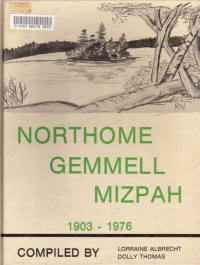 May 7, 1912 the Commercial Club requested money for a illustrated booklet of Northome and vicinity. $25.00 was granted, a copy of this booklet is still around, it is a very descriptive and well prepared book explaining agriculture and our area. Sept. 2, 1913 the Village granted a 25 year franchise to R.N. Hanson for electricity 12-32 power lights. Electricity costs at this time were about $16.00 per month. On Jan. 28, 1913 the light plant burned and the town got electricity from Blackduck & Mid-West Utilities, Inc.
Several petitions were received by the Village to have stumps removed, crosswalks or the streets corduroyed; also board sidewalks built. Corduroying streets means to lay sticks of pulp crossways of the street and then you didn't sink so deep in the mud. The sidewalks of Northome were built on piling as there were lots of swampy areas and hills. I am told by Warren De Bernardeaux, that families of ducks swam under the sidewalks in summer, which must have been a very interesting sight. Sept. 16, 1913 the first concrete sidewalks were ordered installed. The Village paid several doctor bills when the people had no money. In Dec. 1913 a letter was written to J.D. Williams, Industrial Comm. to state that the conditions in the lumber camps was little improved and asked that representatives be sent. There was no follow-up information. June 23, 1914 was the first mention of small pox. There were no taxes up until Sept. 13, 1915, then the first mill rate was set up as 2% for corporation purposes, 5 mills for water and light, and 5 mills for road and bridge. Up until that time the only assessment noted was one or two days labor on road work or $1.50 per day. May 21, 1917 a contract was made with the Creamery for them to pump water for the Village. May 19, 1925 the clerk was instructed to make signs and place them at all public drinking fountains stating that the water supply was unfit for drinking. Apparently the Creamery pumped the water supply for over 10 years as on Aug. 1, 1927 the Village was notified that the Creamery would discontinue the water pumping service. A new hall was approved by a vote of the people and the Village was to be bonded at 4¼% interest to pay for construction cost. This was first approved in July of 1930. In Sept. of the same year 221 chairs were bought for the hall at the cost of $1.00 per chair. The hall was used for many functions some being a theater operated by Mr. Gannon, by the ladies for raising money to buy library books, for card parties and of course for dances. In Jan. of 1934 an airport application was first made. Mr. H.J. Engleking made a trip to St. Paul to submit the application. In Feb. 1934, the Village opened the Municipal Liquor Store. George Elhard was the first manager; with Robert Elhard his assistant. The managers salary was $100.00 per month, and $60.00 per month for the assistant. In 1936 W.P.A. built a pumping station and drilled a well. Cement was 80¢ a sack and laborers could be hired at 30¢ per hour. 1937 brought the building of a warming house on the lake for skaters. The possibility of having a hospital in Northome was brought up on various occasions beginning in 1938. An estimate of cost of equipment, also searching out a doctor was pursued. Housing and office apace was to be made available. A Dr. McDonald was here to search out the possibilities. This is as far as this seemed to progress. 1951 was the year the 1st Christmas Tree and Santa treats were held. In 1953 an interesting decision was made by the council, in that they were going to sell only bottle liquor to the Indians. Sept. 1960 brought the banning of canned Sterno in the Village because of wrongful use by certain individuals. Sterno is an anti-freeze with a high alcohol content. 1967 the Village purchased land for an access to La Brie Lake. In 1970 the Housing Authority was formed with W. DeBernardeaux, Delmer Anderson, Isabelle Beck, Henry Elhard and C.W. Bray. Nov. 13, 1974 The Planning Commission was formed with Jesse Taylor, Orville Curb, Mae Donaldson, Robert Good, Delmer Anderson and Dr. Franklin composing the commission. Northome's City Government is now under the very able direction of Frank Neary, Mayor and the City Council; who is a group of very dedicated citizens that turn out for a meeting on very short notice. They are: Earl Skoe, Robert Malterud, Vernon Bloom and Gary Fisher. These fellows are well supported by the following City employees; Alice Pelland, Clerk, and Alice Griffith, Treasurer. Also a very capable Water and Sewer Engineer, Charles (Red) Walker. Some of the special projects being actively pursued by the council at this time are Water and Sewer as the big, No. 1 item. The airport follows closely behind with my improvements. The Northome Park is being vastly improved upon, complete with fireplaces, picnic tables, shelter and electricity. A new storage garage was recently built out by the water tower. The Following information obtained from the Koochiching County Historical Society of International Falls, Minnesota. Earliest history of this region tells that Claude Fish who settled at Island Lake in 1898 and C.W. Fields, who located three miles west of the present village were the first white inhabitants in this timbered empire. Mr. Fields conducted a stopping place and a postoffice called Bridgie and later Orth, before the land was surveyed. New Bridgie, later changed to Phena, and still later to Northome was built on the homestead of A.M. Brohiem who came in 1900. He built his log cabin on the high bluff just east of the depot. About this time Herman Engelking and some of his brothers filed on claims east of town. Here they built a large sawmill on Bartlett Lake. Sometime in 1901, Mrs. Caroline Engelking and her family arrived and all took homesteads and the township was named Engelwood. Fred Schumaker, Herman Engelking's brother-in-law started the first store in the Ed Engelking house in the east part of town in 1901. In 1902 Fred rented the Ed Bancroft two-story building on Bartlett Lake and later in 1902 built a new frame hotel and store on Main Street. In Feb. 1903 fire destroyed this building and Fred lost his life in the flames. Phena was incorporated as a village in 1903. It is located in the extreme southern part of Koochiching County in Sections 19, 20, 29, and 30 of Township 151, Range 28. The first Mayor was Jake Feldman and the first policeman was Charlie Ross. The first postoffice was in the Schumacker store with Ole M. Olson as first postmaster. In 19014 the Postoffice Department asked suggestions for a new name for Phena. Northome was the terminus of the Minnesota and International Railroad from 1903 to 1905. Other early. merchants to follow Mr. Schumacker: Will Smith and Clint Chartman, who were bought out by Beach & Sons in 1903; A.K. Aaberg, 0.E. Jackson; C.A. Peterson; C.A. Speelman, Gus A. Engelking, and Carl Hillstead. J.J. Neary was at first a saloon keeper and later had a grocery. Other early saloon keepers were Jack Parker, Harry Ladow, Jake Feldman, Hugh McIntosh, Carl Anderson, Ed Loughlin, Pete McLinn, "Sailor Pete" Johnson, Hill and Blocker, and Matt Jones, and Joseph Jones who also homesteaded at Dentaybow. Sabin E. Grindell was one of the early hotel keepers, having a bar room in connection. All of these buildings were located in the old townsite now known as Lake Street. West of the Grindell Hotel, Whitford Bros. built a three-story hotel. First minister of any faith to hold services was George P. Watson, Methodist who held a meeting in the dining room of the Grindell Hotel in the late fall of 1901. The second minister, Joseph Astwood build the Presbyterian Church. The first school of Northome opened in the late fall of 1902 with F.H. Louchks, a homesteader, as teacher and an enrollment of 12 pupils. The school stood on the hill directly opposite the old creamery. The people of the community donated the lumber and erected the building which served as both school and church. The first music teacher was Mrs. Lewis Borchert and she was followed by Flora Whitford. Mr. and Mrs. J.E. Cowan started and operated the Northome Bank for a long time. The first couple married in the village of Northome was Gustave Engelking and Sophia M. Johnson, the Rev. Geo. P. Watson, officiating. Aad A. Tone and T.L. Duncan, Attorneys-at-law, were early homesteaders. Their temporary law offices were over the Schumacker and Enli store. There were two newspapers of the early days. One was owned and edited by A.L. LaFreniere and the other by George Shier. Mr. LaFreniere came to Northome in March 1902 and edited the Bridgie Record, a little later, the Itasca County Record, and later known as the Northome Record. The Bridgie News was started about the same time by Shier. The chief business was the publishing of land office notices of final proof on claims and contest notices. Other early settlers at Northome include Wm. Durrin who had a sawmill near Northome for many years; E.E. Riley who helped with every movement for good; George Hanchett, the first blacksmith at Northome; R.H. Collar, homesteader and carpenter as veil as Jack Parker; Edward Engelking, homesteader and lumberman; Geo. P. Fraley, homesteader and sawmill operator; Lindsay M. Garrison, homesteader and cook; Willis G. McCrady, principal of Northome School; Emma Kolbe, dressmaker; Campbell L. Bailey, real estate man; Engelbret Enli, homesteader and clerk for C.A. Peterson; Anton Lundberg, timber dealer; Eliza F. Cowan, secretary for Feeney Land and Security Co., and Percy Scribner, cedar inspector. A.J. Porter, James Troy, Peter Johnson, Edgar Sykes, Fred Winkle, Wm. E. Engelking, Denis Johnson, and Herman A. Bloom were all homesteaders. Before there was a resident minister the settlers and lumber camps were served by Frank Higgins and H.H. Kingman, missionaries. The first resident minister was Rev. Brokaw of the Methodist Church. Dr. Skaro from Minneapolis was an early settler in the Wildwood community and he cared for the settlers far and wide. Not far from his cabin were the homesteads of Emma Belin and Emma Norberg (Mrs. A. K. Aaberg) and the John Bursack family. When the railroad reached Northome in August 1903 a Mr. Fluke was the first depot agent. Among the first settlers at Island Lake in addition to the Claude Fish family were the John Guptil, John Cunningham, J.J. Rose and the Frederic families. Mr. Cunningham, Mr. Rose and Mr. Frederic were Civil War Veterans as well as Charles Sumner.